Antarctica was the last continent to be discovered, and the first confirmed landfall was on January 24, 1895. However, most discussions of "early" world maps seem to peter out well before that, such as this Wikipedia article which only goes up to 1630. The situation is muddied even more by the fact that Antarctica (known then as Terra Australis) appeared on many world maps before it was even discovered, such as this 1570 map. However, this is based on arguments from legends and various erroneous information, rather than on any actual evidence. Surely after humanity first set foot on the "last continent", it wasn't long before they started mapping the real shape of it. When was the first map produced based on this real information (regardless of whether it was actually "accurate" in the era before we had artificial satellite technology etc)? This question is made even more important by the fact that a world map incorporating this shape would be "largely" complete, although world maps would arguably not really be complete (in terms of approximate landmass shapes) until the first whole maps of Severnaya Zemlya were completed in 1932. General answer: it will probably depend what you define as "the shape". Ultimately, once landfall was made on opposite coasts (1820-1840), and land was proven to be there, it was a matter of looking at all the places a ship had sailed through without hitting anything, concluding that the coastline must be further south than that, and drawing in a dotted line to taste. As Antarctica is basically circular, this worked out pretty well - the inferred coastline was broadly similar to what was actually there. As successive expeditions reached new stretches of the coastline, the estimates were refined and the known bits were drawn in, until by the late-1940s early-1950s the whole coastline was charted. Map as of 1911, for example: (source; more examples). Note that this is basically correct in its outline save for the spurious "second peninsula" in the Weddell Sea (no idea why that got in there) and a certain ambiguity as to whether Graham Land connected to the mainland or not. The more precise answer: according to a helpful article in Polar Record, 1844. The first map to use the new place name was published in 1843, and the first map to show a complete outline of the continent, estimated from expedition reports, was produced in 1844. A very interesting question, as it turns out. 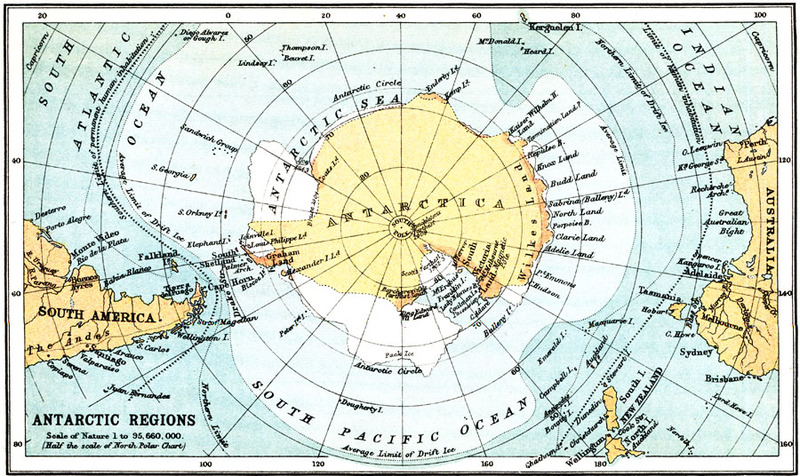 The coast of Antarctica wasn't definitively sighted until about 1820, so no globe until then would have featured it. I found this pocket globe made by Abel Klinger in I believe 18801 that shows the barest outline of some of the coast of Antarctica. Examining some globes from the same manufacturer in 1855, I can't see any hint of it. One would imagine there must be one earlier than 1880 though2. 1- The text just says "end of the 19th Century". However, I've found other references to his pocket globes dated 1880. So I could be a few years wrong here. 2 - Vastly complicating this search is the fact that people don't like to show pictures of largely blank areas of a globe. Not the answer you're looking for? Browse other questions tagged maps antarctica cartography or ask your own question.